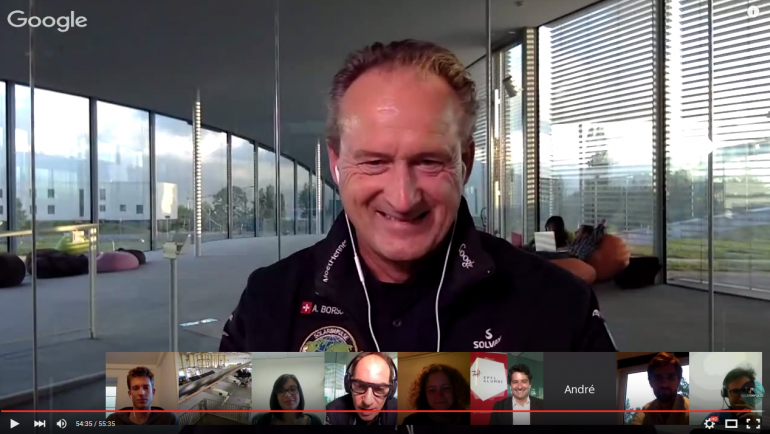 André Borschberg, Co-Founder, CEO and Pilot of Solar Impulse kindly accepted to chat with the EPFL Alumni community through a videoconference recorded at EPFL Rolex Learning Center on September 23, 2015. The discussion was moderated by Gregory Blatt, Managing Director of Solar Impulse and Aymeric Sallin, Chairman of the EPFL Alumni Advisory Board. In addition, André Borschberg answered questions from 5 Alumni based around the world (Australia, USA, Norway, UK and Switzerland). The Solar Impulse project intends to achieve the first circumnavigation of the Earth by a piloted aircraft using only solar power. As one of the two pilots of the solar aircraft (together with Bertrand Piccard), André Borschberg set a world record for the longest ever flight after a five-day and 5,100-mile trip from Japan to Hawaii in July 2015. Currently halfway through its around-the-world tour, Solar Impulse plans to resume its flight in the spring of 2016. André Borschberg graduated from EPFL (with a diploma in mechanical engineering in 1977) and from MIT Sloan School of Management. He trained as a pilot in the Swiss Air Force. Before the Solar Impulse project, he successfully launched several technology ventures and works for leading management consulting firms.